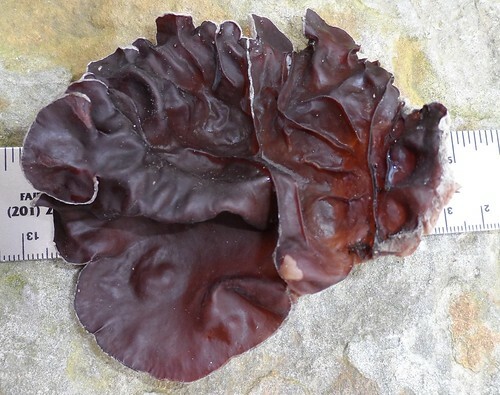 Dangers: don not mistake Raisin Jelly Cup (Ascotremella faginea) for Wood's Ears. Clusters of Wood's Ear mushrooms. Note the gray tops and brown/dark purple undersides. Close-up of the topside and edge of Wood's Ear. Close-up of the bottom side. Note the ridges just like a human's ear. Assorted Wood's Ear ready for cooking. 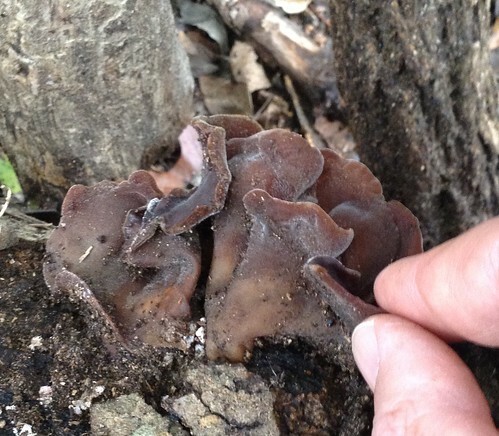 Mushrooms of all types spring up after a heavy rains but few are as distinctive as the brown-gray, rubbery Wood's Ear. They appear only on dead wood which they slowly break down. 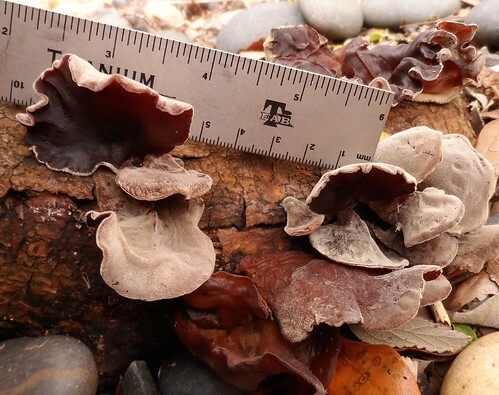 Wood Ear mushrooms prefer the dead trunks of Elderberry bushes but pretty much any hardwood can be overrun by these oddities of nature any time of the year as long as hard rains have recently fallen. Shady areas are more likely to have a growth of Wood's Ear as these cooler spots don't dry out as quickly. 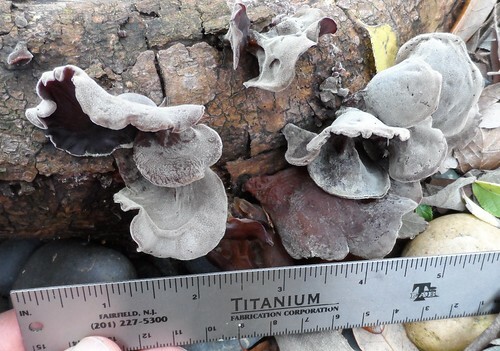 Wood Ear's actually do look like ears in size and rough shape. Often they will form upside down cup shapes when young (~1" across) and then widening out into broad fans (3"-5") as they mature. However big they grow these mushroom never thicken, remaining under 1/4" thick. The topside of these mushrooms is usually gray and powdery. Underneath they are shiny, dark-brown to very dark-purple. Held up to the light Wood's Ear are semi-translucent rather than opaque. If the rains stop and dry weather appears the Wood's Ear mushrooms will shrink down to half their size and harden into a shell-like mass. Once shrunk, the gray exterior is still easily recognized. These dried mushrooms can be harvested from the tree and stored for use later. 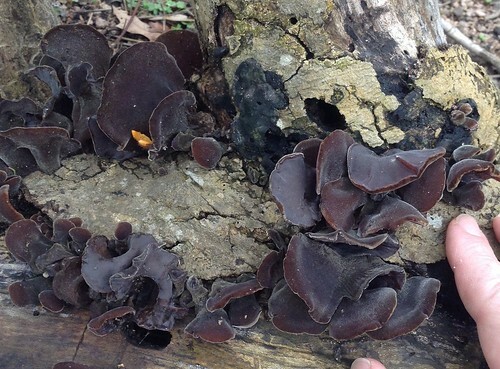 Wood's Ear mushrooms are the traditional Black mushrooms used in Chinese Hot and Sour soup. Tasteless by themselves, they readily absorb the flavors of whatever broth they are immersed. Cut the mushrooms, either fresh or dried, into finger-sized strips and add them to soups, hot pots, pot roasts, or any other dish that involves a broth. 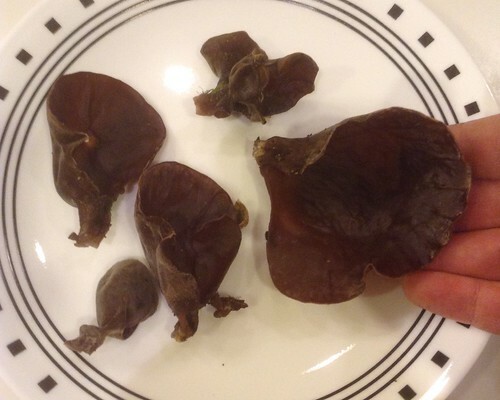 Beware the somewhat similar looking Raisin Jelly Cup Mushrooms. 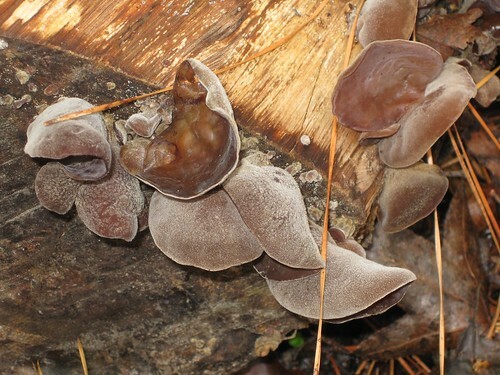 The inedible Jelly Cups grow as lumpy, brain-like clumps instead of the flat, ear-like shape of Wood's Ear mushrooms.